Register for MACDC's Lobby Day! Let elected officials know that you support Community Development in MA! MACDC Members helped 81,219 families with housing, jobs & other services in 2016. MACDC Members bring residents together to build community & to advocate for shared values. MACDC Members in 2016 provided support to businesses that created or preserved 5,285 jobs. MACDC Members in 2016 built or preserved 1,643 homes for individuals & families. MACDC Members bring people together to celebrate community through arts & cultural programming. MACDC is an association of mission-driven community development organizations dedicated to creating places of opportunity where ALL people can live with dignity while participating in and benefiting from our Commonwealth's economy. 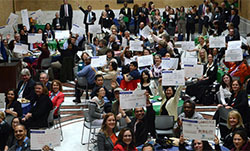 Join MACDC, your colleagues and other champions for Community Development at the Massachusetts State House for a day of advocacy, engagement, and network. As a tool to increase and establish a diversified mix of funding sources for CDCs in Massachusetts, the CITC program is a great success. But that isn't a complete or satisfactory understanding of the CITC program's impact on our field. Through this report, MACDC explores the impacts of the CITC program in 2016, 2107, and 2018. Dig into the CITC fundraising data. Learn about the business sectors and zip codes with the greatest levels of support. Check out the four pages of detailed information. MACDC President Joe Kriesberg and MassHousing’s Executive Director Chrystal Kornegay joined in a dialogue with students from the Institute for Nonprofit Practice to kick off a conversation on ways to increase the hiring, engagement, and retention of professionals of color in the community development and planning field.